You sweat a lot in Indonesia. It’s near/on the equator, it’s humid, and there’s not much air-conditioning to speak of. When asked by another teacher why Americans don’t bathe twice a day, I told him because we don’t sweat inside our workplaces since there’s usually central air conditioning. I reassured him that Americans are not smelly people and that I left my habit of once-a-day-bathing (or every other!) back home in the U.S. and began bathing twice a day—not just to wash off the day’s perspiration, but also to give a satisfactory answer to the habitual question of “sudah mandi (have you bathed yet)?” from just about everyone in my boarding house at 5pm everyday. Asking someone if they’ve bathed yet seems to be a normal conversation starter here (perfect for first dates!). I’m talking about sweat because I recently had my sweatiest moment in quite some time. It involved me dancing on a stage with some friends and several strangers in front of a couple hundred people whom I did not know. Most of the sweat wasn’t from the dancing itself, but from a profound sense of embarrassment as I put on a goofy smile and pointed my fingers in the air in my best attempt at joget. Or maybe it was just because I made the ill-advised choice of wearing a corduroy shirt in Indonesia. To backtrack: my kosan (dorm-style housing) “parents” Pak Ito and Bu Laras invited me to a party in Belitang, a town one hour from Martapura where many people in my community come from. Bu Laras’ sister still lives there and the party was in her village (more like a hamlet than a village, but I can’t just throw the word hamlet around now can I?!). Their family is part of the large Javanese transmigration in this country. So, despite being in a small Sumatran rice town, this party would be a Javanese affair. Pak Ito assured me there would be joget, which, as far as I can tell, is a little dance you do with your arms pointing this way and that way, while kind of stepping around and raising your shoulders up to the music. It’s usually accompanied by dangdut, one of Indonesia’s most popular musical traditions. Use your favorite search engine to learn more about these two Indonesian pastimes! So the day of the party rolls around, and the whole gang—Pak Ito, Bu Laras, their son Marta and his wife Nelly, Dina and Arjun (Marta and Nelly’s kids), Shella (Ito and Laras’ young daughter), and myself—piles into the minivan. Seeing as I’m the only one in the car who doesn’t regularly wake up before 7am, I fall asleep on the way there. (Side note: most people in Indonesia wake up around 5am every day. Since the first call to prayer is at this time, most people have to wake up then, but I get the feeling that people would wake up this early anyways. I usually wake up at 9 or 10.) We arrive in Belitang around 8:30am and the party is in full swing. There is a stage up front, several rows of plastic chairs in the main seating area, an area for cooking (boasting a massive pot of rice), and another area where the food is set out. Most of the men sit in the front area smoking, and drinking coffee or tea. The women are crowded near the cooking area, which also has several rows of plastic chairs. The music playing is very loud, and most people can’t really hear each other. I sit down with Pak Ito and some men next to him ask about me. Many people are staring or stealing glances at me, something I am more-or-less used to by now. It occurs to me that I don’t know the reason for the party, so I ask Pak Ito. He tells me “sunat” and does a scissor motion with his fingers. That’s right, this is a circumcision party. Later on I grab a plate of food and eat with Riski, Bu Laras and Pak Ito’s nephew and my closest friend in Martapura. There are four flat-screen TVs set up throughout the party area. A camera crew is filming the people dancing on the stage, and it’s being shown live on the TVs. At one point, the boy gets on stage and gives a speech at the behest of his parents. Afterwards a huge crowd of kids runs onto the stage and gives the boy (also named Riski) a bunch of presents. As I’m watching all this in high-definition and shoveling rendang in my mouth, I think about how it’s nice to just observe this tradition and not have the attention on me, as is so often the case in social gatherings I attend here. This moment does not last long. After I finished my meal, Bu Laras and Nelly came up to me and started telling me to get up because it’s time to dance on stage. They had mentioned beforehand that I should joget, but I didn’t think they’d follow through. They did and my weak attempts at declining were ignored. I walked towards the stage with Riski, Bu Laras, and Nelly, past one of the TVs I would soon be the subject of, and through a crowd of people who await the bule joget performance. After I danced through another song and sat back down in the soothing climate that is the back of the party, I thought about what had just went down. Yes, I got dragged onstage to dance in front of a huge party of people who were already watching my every move. But there was a moment amidst the blur onstage when I looked around and realized it wasn’t just about watching the bule dance. Everyone from Martapura who came to the party that day was on the stage at the same time. At one point, the announcer shouted “the Martapura Family.” Lo and behold, it was indeed our hamlet up there doing the joget, and no one looked entirely comfortable in the 90 degree heat. Back in the party, when Riski sits down next to me, I pat him on the back and it’s drenched like my own. 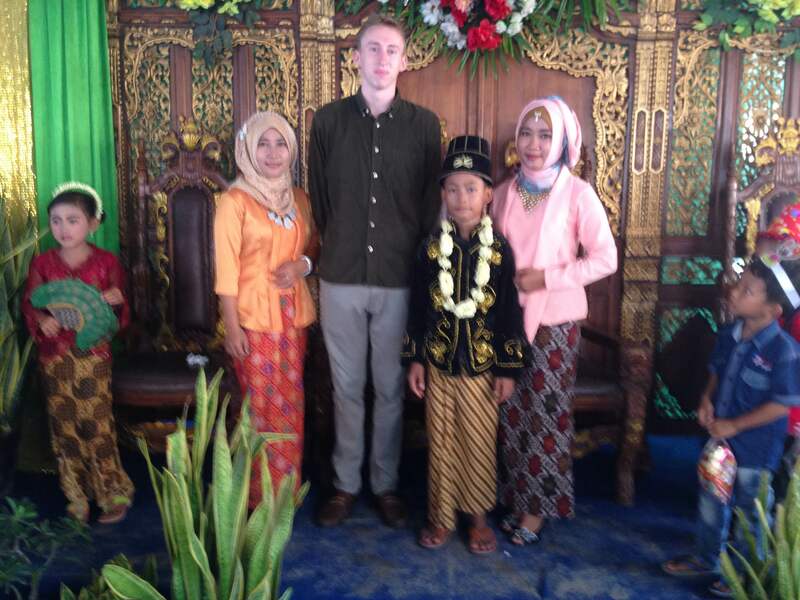 Patrick Dougherty is an English Teaching Assistant (ETA) placed in Martapura, South Sumatra (not to be confused with Martapura, South Kalimantan) at SMAN 3. He graduated from Loyola University New Orleans in 2014. He looks forward to impressing any Indonesian people he meets back in the U.S. with his mediocre Bahasa Indonesia. You can read more from him at https://patrickdoughertyindo.wordpress.com. Thanks for sharing Patrick. Sounds like it was a wild and crazy party. And with the surprise theme too! I hope the young man got some good presents.